Choosing tables for your event just got easier with our latest Product Guide. Here our event rental specialists walk you through not only your table options, but how the table you choose can make the event even more successful. For example, did you know round tables encourage group communication? Learn more about event rental tables from our experts. Tables play an essential role in the success of an event. As a key element of the room layout, tables create pathways - both literal and metaphorical - that enable guests to share ideas and make new connections. Group dynamics - round tables eliminate the “power seat” at the head of the table. Sightlines and walkways - the right layout ensures all guests have equal access. Event space utility - collapsible tables and chairs or half-rounds enable you to do more with limited space. If you’re looking for layout ideas or helpful suggestions, contact a local event specialist who’s familiar with your event type. Learn more about the rental tables available from Marquee Event Rentals below. Choose rectangular tables for events with a classroom-stylelayout, or an informal gathering such as a family picnic. Rectangular tables are a popular choice for corporate events or conferences as refreshment tables, or to display promotional material. Marquee Event Rentals offers a variety of rectangular table options, including banquet tables and farm tables, to suit different different event themes and settings. 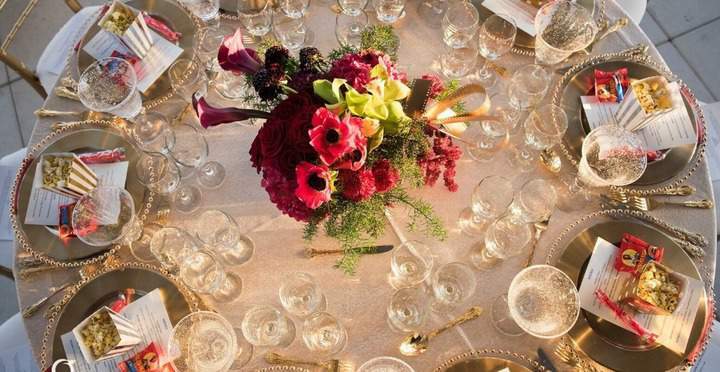 Most wedding, fundraisers, and banquet dinners utilizeround tables. Round tables promote guest interaction and accommodate formal centerpieces. They are also a good choice for breakout discussion groups because there are no isolating corners, and no one sits at the head of the table. If your event space must perform double duty as a presentation room and breakout session space, half-round tables are a smart choice. Use half-round tables during the presentation to provide walkways and better sightlines. Then, when the presentation ends, push two tables together to create a round table configuration that is optimal for both discussion and food service. If your event includes a buffet, choose serpentine tables to maximize space and give guests easy access to food and drink. Marquee also offers linen rental for serpentine tables, or any other table configuration. Just ask your Marquee event rental specialist for a free quote. Cocktail tables paired with lounge-style seating encourage guests to network and mingle. Choose cocktail tables if your event includes a dance floor, bar area, or if you don’t plan to have a seated, formal meal. Marquee is a full-service event rental company with the largest inventory in the industry. In addition to table rentals for events of any size, we rent chairs, linens, and tabletop accessories. Contact an event rental specialist in Atlanta, Chicago, Kansas City, Milwaukee, Austin, Dallas, or San Antonio for a complimentary consultation.